Take a Spring Roast of Lamb to new heights this Easter with our Mission Fig Balsamic Spread! 2. Rub the salt, pepper and Rosemary oil on the Lamb. Use a non stick oven-proof skillet and medium high heat. Sear the rack of lamb meaty side up first. 3-4 minutes. Flip once it’s quite crusty and repeat. Drain the excess oil and discard. 3. 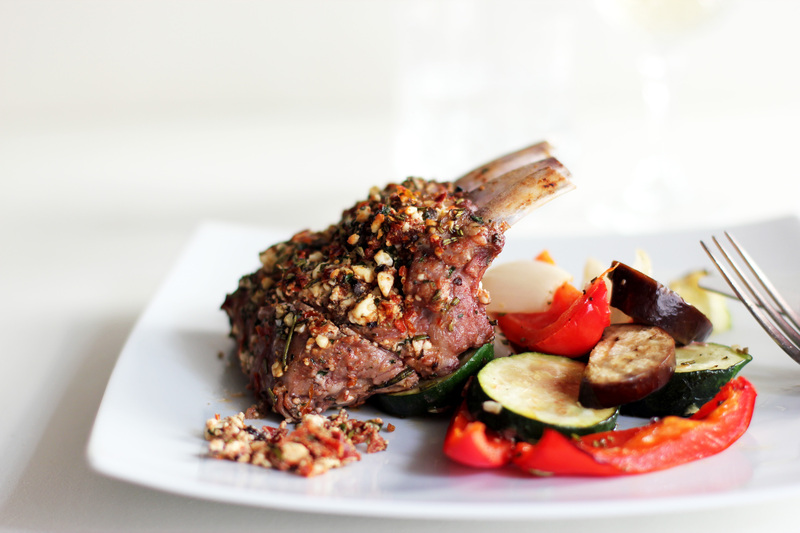 Place the lamb in the oven and cook until the internal temperature reaches 140°F/60°C. Depending on the thickness of the lamb it could be from 10-20 minutes, so check with a meat thermometer or cut into the center of the roast. 4. Once it reaches the appropriate temperature, the meat will actually be underdone. Don’t worry. Place on a platter and cover with foil to rest for 10-15 minutes. This will not only relax the meat, it will continue to cook so it will be medium rare. Judge accordingly for your preferences. 5 In the meantime, add the Ginger Fig balsamic vinegar and Fig Balsamic Spread to the drippings and stir over medium high heat. It should taste sweet and tangy – adjust to taste. Add the wine, stir and taste again. Let it boil down to a sauce – just a few minutes. It should coat the back of a spoon. 6. Carve the rack into chops, by slicing between the ribs. Pour the sauce over the chops and serve. It’s great served with new potatoes and first harvest Spring asparagus.